There are two main types of adult scoliosis – Pre-existing (usually adolescent scoliosis), which in adulthood becomes known as Adolescent Scoliosis in Adult (ASA); and the development of a new scoliosis in adults, usually as a result of spinal degeneration which is known as Degenerative De-Novo Scoliosis (DDS) . Since De-Novo scoliosis is a consequence of spinal degeneration with age, it rarely presents before 40 years of age – although in patients with no known history of scoliosis, differentiation from degenerative idiopathic scoliosis may be difficult. Degenerative scoliosis is associated with a variety of conditions. Osteoporosis, degenerative disk disease, compression fractures and spinal canal stenosis have all been implicated in the development of degenerative scoliosis. How is De-Novo scoliosis diagnosed? Patients with degenerative De-Novo scoliosis typically present with complaints ranging from debilitating back or lower extremity pain and spinal imbalance to incidental findings on lumbar radiographs. As usual scoliosis will be diagnosed by a combination of physical examination and X-ray or imaging techniques. In the case of De-Novo scoliosis, a thorough examination of the patients medical history will help to determine any underlying condition which is implemented in the development of scoliosis. Counter intuitively, the pain caused as a result of adult scoliosis is not related to the size of the curve. Several good studies show there is little to no relationship between the size of the curve and the intensity of pain – therefore a 20 degree and a 55 degree curve have the same chance of causing pain in an adult. This means that a visual observation is not always sufficient to rule out scoliosis in adults, and a professional consultation is the best approach. What are the symptoms of De-Novo scoliosis? Unfortunately, many health professionals – and even some scoliosis practitioners still believe that scoliosis does not cause pain. While it is true that scoliosis in children and young adults (even where a considerable curve is present) is not usually associated with pain, this fact is often conflated, leaving many believing scoliosis never causes pain. Sadly this means many cases of adult scoliosis are never properly investigated, with scoliosis being dismissed as a cause due to the pain. In reality, in adults between the ages of 50 and 80 who suffer from chronic lower back pain, research shows that up 40% will have adult scoliosis and would benefit from specialised treatment. Adult scoliosis patients will typically experience significant back pain and stiffness. As spinal degeneration increases, the inter-vertebral discs become narrowed and nerve compression develops resulting in constant sciatica, pin’s and needle’s, numbness or weakness in the legs. The spinal canal can also become narrowed and result in spinal stenosis where spinal cord is squeezed so the patient experiences heaviness in the legs, leg pain and difficulty walking. Curve location – lumbar and thoraco-lumbar curves typically tend to be more painful especially if they are singe curves. Postural Balance – Adults with good postural balance will have less symptom, thus often those who have double curves which are balanced will have less pain. Bent forward posture where an adults head and chest is in front of their pelvis is often the primary determinant of the severity of pain and symptoms. Adults whose head or chest is shifted to the left or right will also experience pain than those who are in better alignment. How is scoliosis in adults treated? 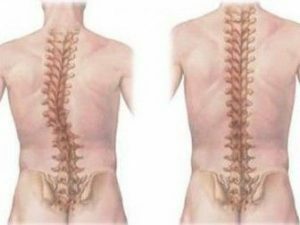 To achieve effective treatment for adult scoliosis, it is important to be able to to be able to differentiate between the symptoms that are caused by the degeneration of the spine as compared to those that are caused by the deformity and its progression. This means that unless treatment addresses the postural alteration or deformity, the pain and symptoms won’t be improved. This applies to any back-rehabilitation regime, medication course or surgical procedure. Recent advances in non-surgical treatment have shown significant improvement in pain and symptoms in those with adult scoliosis. This involves the patient learning how to self-correct their abnormal posture, not just strengthen their lower back or core. When combined with a customised Scoli-Brace which helps to support the posture in a more comfortable position, pain is reduced and quality of life is improved. When non-surgical treatment is ineffective surgery is often the only option, especially when leg pain becomes incapacitating and walking is almost impossible. Unfortunately, surgery at this stage is always complex and with significant risk. This is why it is important to find not only a good spinal surgeon, but also one who specialises in scoliosis for the best possible outcome.